Damian: I thought it was from God. Damian: Well, you know, sometimes you tell people about mum, and they give you money or sweets. Well, I told God and, well, who else would have that kind of money? What would you do if you had a million dollars? 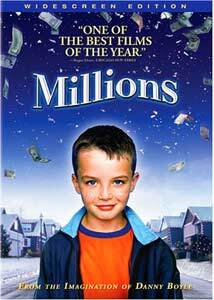 The young protagonists of Millions are faced with that very dilemma after a bag of cash (�265,000, give or take) literally drops out of the sky one day, bouncing off a train and crashing into their cardboard fort. Seven-year-old Damian (Alex Etel), who believes the money is a gift from God, wants to give it to the poor. His older brother Anthony (Lewis McGibbon), more of a realist, decides the best bet would be to invest it in real estate, and make even more money. Director Danny Boyle, best known for sending Ewan McGregor down a filthy toilet in search of his next fix (Trainspotting) and unleashing lightning-fast zombies on London (28 Days Later), brings the same skewed visual sensibility to Millions, a heartfelt, imaginative, and surprisingly emotional family film. It follows Damian and Anthony as they figure out what to do with the cash, which must be disposed of in two weeks (right around Christmas Eve, it seems), at which time the British government will switch over to the Euro and the cash will be worthless. The story is told from Damian's point-of-view, but it isn't a saccharine or cloying film, rather one of boundless creativity. Boyle illustrates the boy's daydreams with impressive visuals. Damian is obsessed with the saints, collecting facts about them like Pok�mon cards, and is visited by Claire of Assisi (smoking a joint) and the Ugandan martyrs of 1881. The boys' mother has died, and they live with their father Ronnie (James Nesbitt) in a bland housing development outside of Liverpool. Damian has a child's understanding of religion, and keeps asking the apparitions if they have met a new saint in heaven, his mother. "Did she heal the sick?" they ask. No, the boy responds, she worked at a makeup counter. Damian wants to use the money to help the needy. He takes a homeless woman and her friends out for pizza, then mistakes his Mormon neighbors' life of simplicity for one of poverty (they're more than happy to use the cash he stuffs into their mail box to buy "comforts" like, say, a huge widescreen TV). But he and Anthony quickly attract attention and suspicion at school, when the elder hands out �20 notes to buy popularity and Damian drops thousands into a charity collection box. When a classmate whose father is a policeman tells them the cash was stolen, Damian wants to give it back, but Anthony figures the money, which had been slated for destruction, doesn't deserve such a fate. It's not the money's fault it got stolen, after all. Boyle and screenwriter Frank Cattrell Boyce have made a film that doesn't talk down to its audience. It's full of whimsy and artifice, but also real ideas. The central message, that money is just a means to an end, and that it's the end that really matters, could drop in like a lead weight, but these are real characters that react in very real ways. The pleasure is not watching the boys (and later, their father) figure out what to do with the loot, but watching how they learn from the experience, and how that informs their characters. The result is an uplifting fable, but one that feels genuine and earned, not manufactured with a clear moral in mind. It makes all the difference that Boyle was able to find two leads that seem like regular kids, unaware of their own charm. There isn't a false note or contrived moment in young Alex Etel's performance, and without him, the movie wouldn't work nearly as well. He has such natural chemistry with Lewis McGibbon, it wouldn't have surprised me to learn the two are actually brothers (they aren't). Adults do figure in, but are somewhat indistinct, viewed from a child's perspective, particularly the villain, a terrifying figure billed only as The Man (Christopher Fulford), who pulled off the robbery and is searching for the missing spoils (there are a few chases sequences, including one set during a Christmas pageant, that recall the children's frantic flight in Night of the Hunter rather than an over-the-top Home Alone-style gag-fest). Millions sounds like something really awful, and it could be, in the hands of a less-skilled filmmaker. But Boyle strikes just the right tone, creating a story in which wonderful things happen, not because a screenwriter is forcing them to, but because, sometimes, wonderful things happen. A family film this engaging and intelligent is a miracle in and of itself. Image Transfer Review: Danny Boyle's usual visual tricks (different film stocks, intentional grain) are on display in Millions, and the DVD is a faithful recreation of the director's vision. Colors are storybook bright throughout, and show great detail. I noted no mastering problems like aliasing or artifacting. The source print is free of blemishes as well. Audio Transfer Review: The DD 5.1 English mix is surprisingly active for a family film�all the channels are used to good effect to bring us into the film's rather skewed, childlike reality. The front soundstage presents the score and dialogue well, with good directionality, while the surrounds constantly enhance the atmosphere, particularly during noisier sequences, such as the train robbery. Extras Review: Millions doesn't look like a movie you want to watch, I know, but if you can get past the horrendous cover art, this is actually a fairly decent DVD, if a little lacking in some areas. Director Danny Boyle and writer Frank Boyce provide a chatty commentary track that features lots of trivia about the development of the story and the filming process. It's a little screen-specific, with Boyle discussing particular shots or special effects. A collection of 10 deleted scenes (31m:41s) includes moments cut to keep the running time down, though many work quite well on their own, including a dream/nightmare sequence in which Damian's saintly action figures move around. Many of the scenes are presented with incomplete special effects, but this is still an above-average deleted scenes gallery. In addition to a soundtrack ad and the theatrical trailer, there's something called a DVD Cutdown, which is basically the entire movie edited into a three-minute music video. An odd inclusion, but the music is nice. Behind the Scenes consists of four very brief featurettes focusing on different aspects of the story and production. In Million Pounds, the film's young stars reveal what they would do if they had that much cash. Saints (03m:33s) explores the use of the saints as a recurring motif and includes discussion of the scene in which Damian releases all the doves. Spirit of the Film (03m:30s) covers thoughts from the director and producer on finding the right balance for the film's tone and the performances of the adult characters. Finally, Robbery (04m:11s) explores the complexities of filming the train robbery sequence. The menus are very creative, with a cardboard box motif lifted from the film. A magical family film made with real intelligence and heart, Millions is one of the year's best�a story told from a child's perspective, with all the innocence, imagination, and wonder of youth. With excellent picture and sound and a nice smattering of supplements, Fox's DVD should be considered essential holiday viewing.